Why isn’t oil royalty distributed equally? THE distribution of oil royalty remains a heated election issue in Malaysia’s oil-producing states. This was again brought home during by-election on Sept 25 in the Pengkalan Kubor, Kelantan — one of four oil-producing states in Malaysia — which was won by the Barisan Nasional. Shortly before the by-election, the Ministry of Finance had announced the findings of the Special Committee to Determine Cash Payments from Petroleum in the East Coast of Peninsular Malaysia. The findings, however, have raised further questions on oil royalty payments. The ministry pointed out in a statement that under the Settlement Agreements that Petroliam Nasional Bhd (Petronas) has signed with Kelantan, Terengganu and Pahang, the states are to receive 5% of the value of the petroleum discovered within three nautical miles of their coasts. The ministry said that “as of today, no oil has been found in the east coast states of Peninsula Malaysia which include Kelantan, Terengganu and Pahang”. Hence, Petronas is not legally bound to pay oil royalties to any state in the East Coast of Peninsular Malaysia. If this is the case, why do some states still receive oil royalty payments? Based on its accounts for the financial year ended Dec 31, 2013, Petronas paid oil royalties to the state governments of Sarawak, Sabah and Terengganu amounting to some RM5.8 billion. Terengganu received the 5% oil royalty payment from Petronas even though its petroleum reserves do not fall within the three nautical mile boundary, leading some to ask why Kelantan, which also has oil fields located beyond the three nautical mile limit, is not entitled to the same payment. The federal government is relying on the Emergency Ordinance Act 1969 to justify the three nautical mile requirement. In other words, a state is not entitled to cash payments for oil discovered beyond three nautical miles of its coast. Some quarters have described the payments made by Petronas to the Terengganu state government as wang ehsan, or goodwill payments, in aid of development and poverty eradication. There is no formal written agreement or standard procedure for wang ehsan by the federal government to state governments. Kelantan, on the other hand, is the poorest among the 13 states with a GDP per capita of RM10,672 last year, (Terengganu, RM23,285). Cash payment for its gas fields in block PM301 estimated to be about 70 nautical miles from the coast (see map) would substantially benefit the state. According to the Petroleum Development Act 1974 (PDA) signed between Petronas, the federal government and state governments, all exclusive rights and control of oil resources extracted onshore or offshore were surrendered to Petronas. The PDA also states that Petronas would have to make to “the federal government and the government of any relevant state such cash payment as may be agreed between the parties concerned”. After years of discontent in Kelantan, Prime Minister Datuk Seri Najib Razak announced in 2009 that the federal government would pay wang ehsan to Kelantan from 2010 onwards for any oil products extracted near its shores. However, the payment would be channelled to the state via the Federal Development Department (FDD) there, ostensibly to ensure that the money is used to develop the state. The FDD is an agency of the federal government. This contrasts with the payments to Terengganu, which are made directly to the state government. Dissatisfaction over oil royalty payments had also surfaced in Terengganu in 2000, when the federal government decided that it would no longer pay these directly to the state government, then controlled by PAS. This has prompted some quarters to compare Terengganu’s previous situation with the present one in Kelantan as Terengganu had previously received oil royalties when offshore production began there in 1978. This cash payment continued to be paid directly to the Terengganu state government after Petronas Carigali discovered oil beyond three nautical miles of its shores in the Dulang field, in 1981. 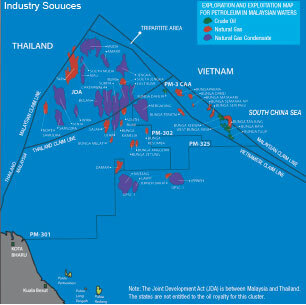 The field is situated about 91.8 nautical miles or 170km off Kerteh, in Block PM6, and has been in production since March 1991, for which additional royalties have been paid.